Chia seeds. I know, they look weird. But don't hate the Chia. It's good for you! And no, these aren't exactly the same Chia seeds found on the clay forms of the "As Seen on TV" products. Those seeds are not FDA approved. Chia seeds are loaded with antioxidants (more than blueberries!) and are a sources of protein, fiber (more than bran! ), calcium, phosphorus, magnesium, potassium, iron, zinc and copper. One blogger source says, Chia "contains 6 times more calcium, 11 times more phosphorus, and 4.6 times more potassium per 100g of edible portion than milk, and have 6 times more iron per 100g of edible portion than spinach, 1.8 times more iron than lentils, and 2.4 times more iron than beef liver." Chia seeds are also considered to be hydrophilic, meaning they can absorb large amounts of water quickly. Great for aiding athletes with hydration. Eaten raw, chia seeds are also a great source of essential fatty acids, offering a healthy balance of both omega-3 and omega-6 fatty acids. Chia is easy-to-use and doesn't require grinding or prep. You can simply toss a tablespoon or two into whatever your making. The texture in your mouth is like poppy seeds with a tiny crunch. Admittedly, it's somewhat difficult to discern what is fact or fiction above the Chia Seed fad. I choose to eat them for me because it's a source of so many things my body needs... especially the Iron. Optional: Couple Tablespoons of slivered almonds. Mix all the ingredients together and keep the mixture in the fridge. You'll think you have the recipe wrong, because it will be so liquidy. Stir the mixture every 10-15 minutes over the course of an hour and let it set overnight. The next day the seeds and almond milk will have congealed to a rice pudding consistency. Be brave... try something new! I use Chia seeds in my breakfast shake! Love them. 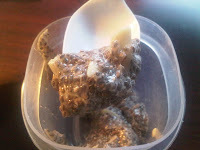 Will have to try your Chia Pudding, what a great after workout treat!! !